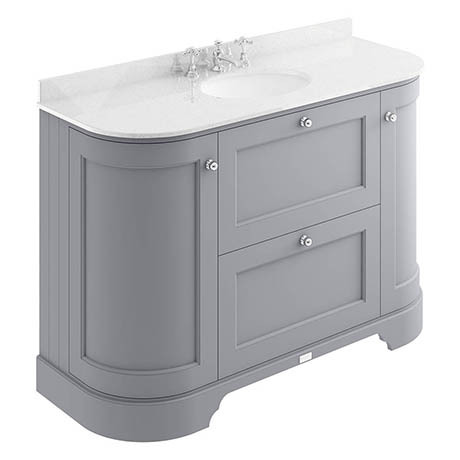 The Bayswater Plummett Grey Curved 1200mm Vanity Unit and White Marble Single Bowl Basin Top will create a unique centre piece to any classic themed bathroom. It's ample storage space provides plenty of room for bathroom essentials while the soft close doors and drawers limits the daily wear and tear and provides a quieter closing action. Made from high quality materials, it features side panelling for a classic look, elegant chrome knobs and a Bayswater logo plate that beautifully finishes the unit. The stunning white marble top co-ordinates beautifully with the classic white china basin.